Owls are solitary creatures, who sleep all day and prowl at night. Because of their nocturnal activity and screeching call, they have been associated with bad luck and death, leading to the conclusion that she is Alakshmi, Lakshmi’s elder twin, the goddess of strife and misfortune. But because of its round eyes that never move and stare straight ahead, the owl has been associated with wisdom . The term “lord with circular eyes” (Choka-dola) is used to refer to Jagannath, the form of Krishna-Vishnu worshipped in Puri, Orissa, leading to speculation that the owl actually represents Lakshmi’s consort, Vishnu. Favoring this line of thought, is the fact that in Hindu mythology, the vahana or vehicle of a deity is always male, not female. But the idea that Lakshmi would ride her own husband, though acceptable to feminists, is abhorrent to traditionalists. They insist that the owl accompanies the goddess; she does not ride it. If she does not ride the owl, then it could be either Vishnu, or Alakshmi. But Vishnu never follows Lakshmi; she follows him, drawn by his ability to uphold order or dharma wherever he goes. And Alakshmi, always accompanies, Lakshmi, for she is the elder sister. In images, Lakshmi is associated with both Vishnu and the owl. 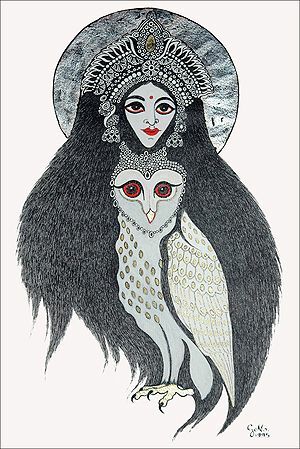 Art historians are of the opinion that since it is inauspicious to portray Alakshmi, artists have chosen to represent her as an owl. But why represent her at all? The idea of Lakshmi having a twin sister is an ancient one. Some say while Lakshmi was born of Brahma’s face, Alakshmi was born from his back. Some say Lakshmi emerged along with Amrita, the nectar of immortality, when the gods were churning the ocean of milk; Alakshmi emerged with Halahal, the dreaded poison with the power to destroy the world. Alakshmi is called many things including Daridra, poverty personified; Kalaha, strife personified; Kalikanni, quarrel personified; Nritti, goddess of decay. In the mythology of Shiva, Alakshmi is Kali, the fearsome aspect of Shakti, while Lakshmi is Gauri, the lovable aspect of Shakti. In Vishnu mythology, Lakshmi adores dharma (acts born of empathy) while Alakshmi adores adharma (acts born of exploitation). Thus Lakshmi and Alakshmi are two halves of a complete whole; Lakshmi is the fruit that is savored while Alakshmi is the waste that is discarded. The two exist as a whole; without either there is neither. In mythology, Lakshmi does not make any value judgment. A bowl of rice feeds a saint and a sinner; a rupee coin has the same value in the hands of a judge and the same value in the hands of a murderer. But Lakshmi always comes with her sister in tow. Failure to acknowledge Alakshmi is dangerous for she represents all the negative energies that accompany any wealth. Everyone knows that money breeds strife and jealousy. Alakshmi embodies that dark aspect of wealth. She is the one who makes rich brothers quarrel. She is the one who divides the household. She is the one who does not allow peace to enter the house of gold. The only way to make Alakshmi weak is to constantly be aware of her; acknowledge her as much as her sister. Typically in rituals, sweets, kept inside the house, are offered to Lakshmi while lemons and chillies, kept outside the house, are meant for Alakshmi. Lakshmi, say the scriptures, never goes anywhere without her sister. In other words, wealth never goes anywhere without the seed of strife. The story goes that Lakshmi and Alakshmi once paid a visit to a trader and asked her who of the two is more beautiful. The trader was frightened of making either one unhappy so he came up with a clever answer that would please both. “Lakshmi is beautiful when she walks towards me. Alakshmi is beautiful when she walks away from me.” Pleased with this response, fortune moved towards the trader while strife moved away.